You need only 5 simple ingredients and 45 minutes for this velvety smooth butternut squash soup, packed with fabulous fall flavors! 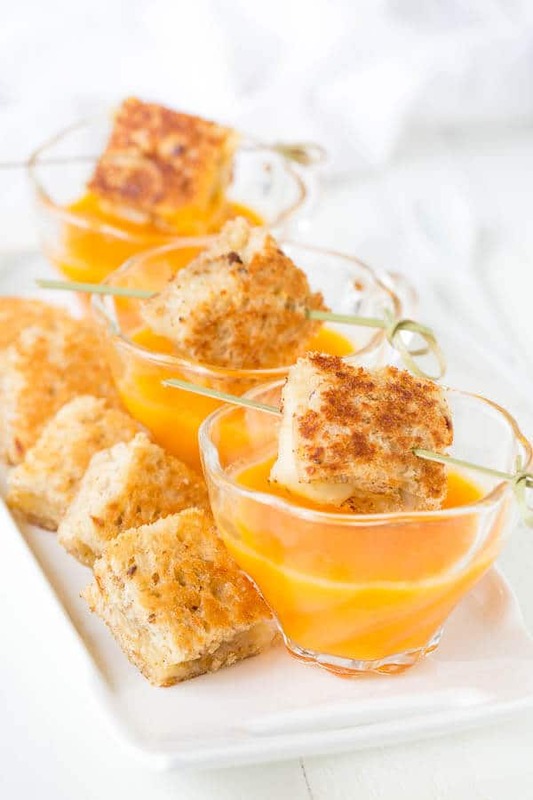 Delicious and elegant make-ahead appetizer for any kind of gathering! Sounds like a tall order? Well, it must be your lucky day, because you just hit the jackpot and landed on this page. This gorgeous golden butternut squash soup requires only 5 simple ingredients and comes together in under 45 minutes. A little longer, if you need to cut that butternut squash yourself. We’re building layers of flavor with bacon, shallot and quality chicken stock. 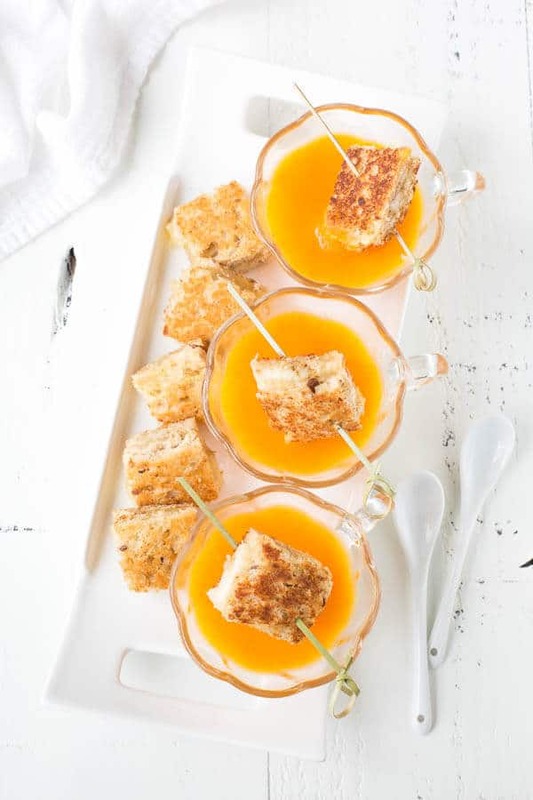 Carrots add just right amount of sweetness and butternut squash is the star of the show. To contrast velvety smooth texture of the soup, serve it with grilled cheese. No brainer, of course. But I want to share with you my favorite combination: whole grain sandwich bread with nutty n’ melty fontina cheese. To. Die. For! Yes, it’s this easy! And you really won’t go wrong with this soup. It’s total crowd-pleaser! Plus, it’s pretty customizable too. You’ll never get bored with this one! Sometimes, I add a little bit of cayenne pepper for a kick, or thyme for nice herby flare. And adding curry powder with a touch of cumin is also pretty darn good. But these add-ons are totally optional. You know, only when you want to change things up a bit. Hope you enjoy this delicious soup soon. Thanks for stopping by! Delicious and elegant make-ahead appetizer for any kind of gathering! To make the soup, in a large dutch oven, cook the bacon over medium heat until crispy. Remove bacon bits onto a plate lined with paper towel. Add chopped shallots into the dutch oven and cook until fragrant over medium heat. Then add carrots and cook for about 3-4 minutes. Stir in cubed butternut squashes and saute for another minute or two. Pour in chicken stock and bring it to boil. And then turn the heat down and simmer until squashes are tender, about 25-30 minutes. Cool the soup slightly. 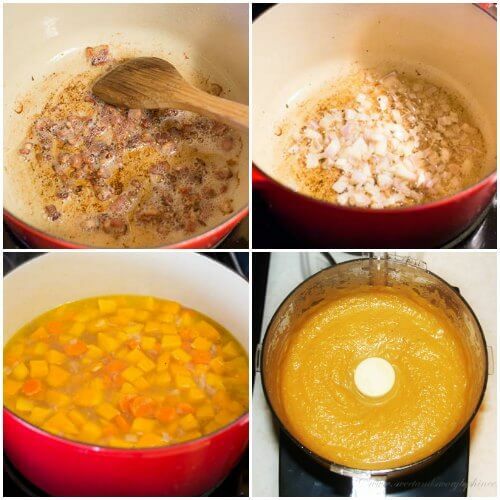 Carefully transfer the soup into a large food processor, or blender. Blend until smooth. If needed, season with salt and black pepper to taste. To make the grilled cheese, preheat a skillet over medium heat. Butter one side of each slice of bread. Working in batches, place 2 bread slices on hot skillet, buttered side down. Layer the cheese and sprinkle about ¼ teaspoon of smoked paprika on each sandwich. Then place 2 slices of bread on top of the cheese, buttered side up. Cook until cheese is softened and bread is nice and golden on the bottom, 2-3 minutes. Using a spatula, carefully flip each sandwich and continue to cook until cheese is melted and the bread is nice and golden, about another 2 minutes. Repeat with the remaining bread. Cut grilled cheese to desired size. 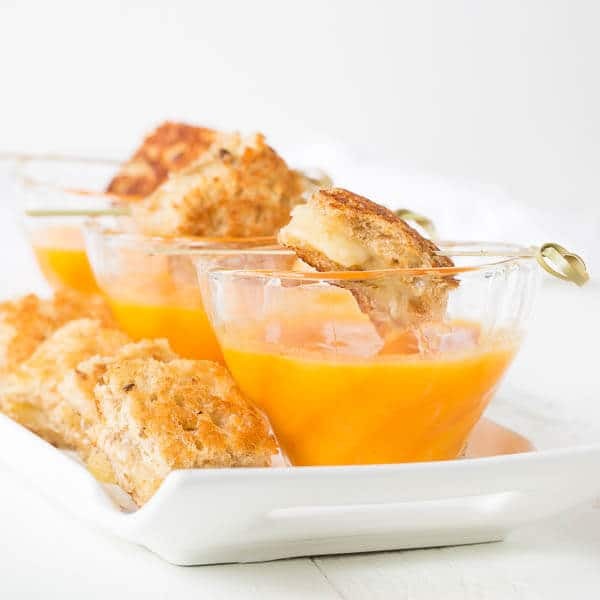 Serve the soup warm or at room temperature with bacon bits and grilled cheese on the side. This recipe was originally published on January 4th, 2014.